Compare and contrast the two server systems. Currently, OME offers two different version of its server software: the original Perl-based OME server which has been in development since 2000; and a lighter, Java-based server/client suite known as the OMERO Platform which provides a hi-performance data management and visualization solution. The two servers have different strength and weaknesses due to the underlying architecture they use. They can also each be used in different ways. There is however a recommended use for each and it is these we will compare in depth. We recommend that users employ the Web User Interface for the original OME server. OMERO includes 3 clients: OMERO.insight and OMERO.importer Java-based desktop clients and OMERO.web browser-based client. OMERO and the original OME Server are separate systems. The original OME Server is a robust and mature environment for server-side analysis and client-side interaction via XML-RPC. OMERO is a Java Enterprise-based application that provides performant, flexible interfaces for most modern application environments and client applications that support import, visualisation, management, and analysis of complex image data sets. Which provides a solid stable platform? Both OME Server and OMERO are now stable and well-established in the community. Active development of the OME Server ceased in 2006, and our efforts since then have focussed on OMERO. Which is best for analysis? The original OME Server has strong server-side analysis with a powerful infrastructure for dynamic typing. OMERO provides a flexible framework for supporting image analysis known as Structured Annotations. Which provides integration with MATLAB? Both systems support access from Matlab. For Matlab with OMERO, see OMERO.Matlab. For Matlab with OME Server, OME and Matlab. Which is simple and easy-to-use? If you want a simple tool for image visualisation and data management, then either OMERO or original OME will work. OMERO's interfaces are better developed and have benefitted from design and updating through our work with Usable Image. However, they are both client-server applications so you may need help from your IT support for installation. Which works best for remote access? If you want to use a remote application on a laptop and get high-speed visualisation of your images on a server, use OMERO. Which allows me to develop my own rich client applications? Use OMERO to develop your applications against. There is a range of language bindings and fast client-server interaction. Currently the OME and OMERO servers are incompatible, due to differences in the underlying data model that were implemented in OMERO. Fundamentally, the design requirements for the two servers are different, and the systems solve different problems. Development History - Why two servers? The original Perl-based OME Server has been developed and regularly released since 2000. It provides image data and metadata visualisation, management, and analysis facilities. 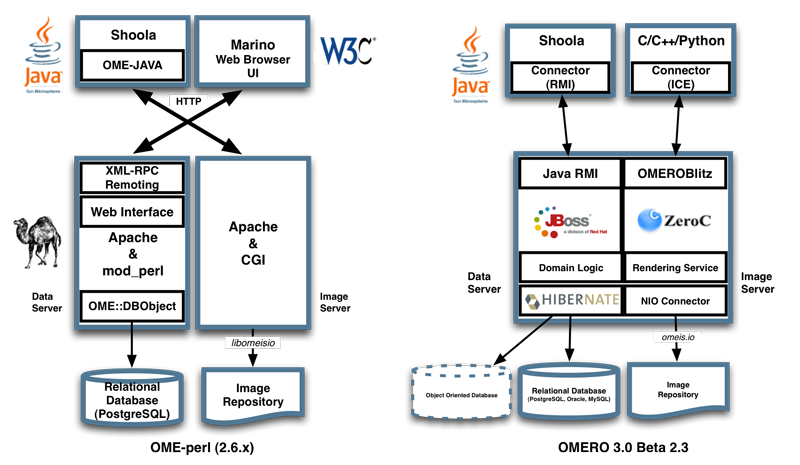 Since 2003, the Dundee group has been developing a remote Java client for image visualisation and management. The tool, codenamed Shoola, had limited functionality because the remoting interfaces available in the Perl-based OME Server could not provide performant data transfer. Starting in 2004, the Dundee group began exploring an alternative architecture for an OME data server. The project, codenamed OME Remote Objects ("OMERO"), has built a Java Enterprise-based server application. This server provided a more performant remoting interface, allowing development of more ambitious functionality in a remote application. For performance reasons, we stopped developing Shoola2.x for the original OME Server in 2005 and have instead been developing remote clients for the OMERO server, OMERO.insight and OMERO.importer. From 2006 the Dundee developers have been working in partnership with the Usable Image (http://www.usableimage.org) team to develop the OMERO.insight and OMERO.importer user interfaces. Usable Image have been conducting hands-on laboratories and interviews with biological scientists and have provided a lot of design input to the applications. With the 2008 release of OMERO.server Beta3 there is now support for analysis in both servers. The latest release of Omero software is here.